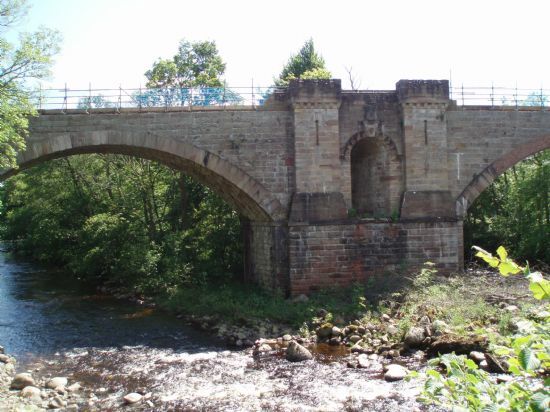 The section of the routeway running from east of Evanton to Rosskeen was examined by the community of Alness. We were looking for remains of the routeway or sites that might have been associated with the routeway through the periods of its use. From the research done so far it looks possible that the routeway may be medieval or earlier in origin but more work needs to take place before this can be confirmed. There are at least seven chambered cairns in the region including the Millcraig Cairns (MHG6314) and a variety of other prehistoric sites including hut circles along the Cnoc Navie Ridge. This prehistoric activity in the area indicates that there have been good communication routes through this region for thousands of years. As part of the project we looked at a variety of religious sites situated along or near the route. Sites such as Alness Old Parish Church and Cemetery (MHG8121), Rosskeen (MHG16255), St Ninians Chapel, Nonikiln (MHG6318) and Kildermorie Chapel (MHG8890) all have indications of an earlier medieval origin. These churches and chapels would have been linked by good routes and help to tell us where roads and routes would have run in the region. 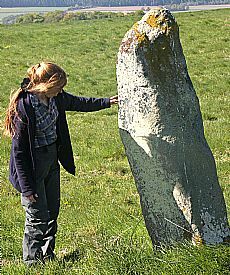 Rosskeen Church lies in close proximity to a Pictish symbol stone known as the Thiefs Stone (MHG14745), an important landmark in earlier pre-Christian and early Christian periods. Other religious sites of interest include the network of medieval hospitals that can be identified across Europe. Obsdale (MHG8318) has been identified with the lands of ‘Hospitill’ which appear in sources from 1384 and 1490 and in several post-Reformation sources. However, there is no physical evidence of a medieval hospital remaining. Alness Motte, more commonly known as Cnoc a’ Chaisteil (MHG8103), is an example of a medieval fortified site of which nothing now remains. This site would have been the base of power in the region, exerting control over the surrounding land, resources and any route ways running through the area. 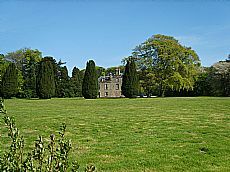 In addition to looking at early sites that might indicate the presence of control over routeways the group looked at later examples of this type of site – the castle or ‘grand house.’ Teaninich House (MHG16406), Contullich Castle (MHG8021) and Newmore Castle (MHG8026) are some examples of ‘power’ sites in the Alness area. 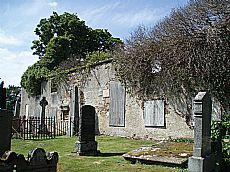 Novar Toll House (MHG8118) is a good example of a site that exerted financial control over later routeways running through Easter Ross in the 1800s. This site was closed when toll houses were abolished in 1866. 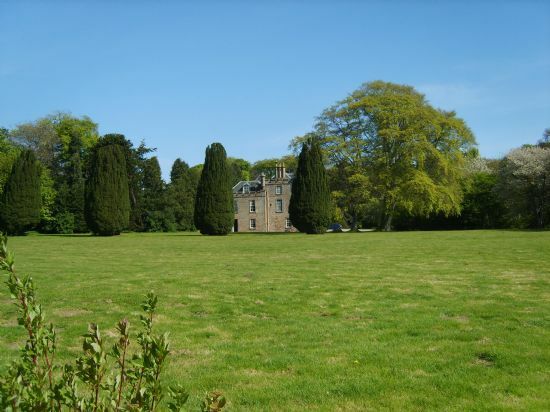 A section of double embanked possible routeway was investigated at the back of Kincraig House Hotel. Measurements showed the width of the feature to be approx 13m from crest to crest. A similar double embanked feature can be found in a field near Skiach, near the old route of the A9. These ‘pockets’ of preserved embankments may be all that remain of some very old roads through the area (MHG54956). 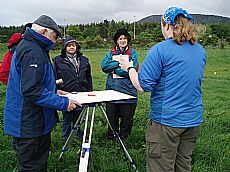 Drove routes running from Carbisdale and Ardgay over to Alness were another interesting later use of routeways investigated during the course. One old routeway of particular interest was the Corskscrew Road leading up out of Alness and away from the main thoroughfare into the high ground, past Contullich and Newmore Castles. Possible crossing points over physical barriers like rivers were also investgated to try and surmise where the route was likely to have gone. As part of the course the group did a plane table survey of a possible moated site at Wester Teaninich (MHG30898). This site would have overlooked the routeway and had good views of the surrounding region. The survey demonstrated that the site currently consists of a platform approx 23x30m with a rhomboidal shape. The platform is about 0.75-1m high and has a ditch running around the northeast and northwest sides. The site had been used as a tree platform over the past 100 years but is now clear of trees. It is also possible that the site might have had earlier origins as a moated site and certainly during the dry spell the group surveyed in it looked plausible that the ditch had been more substantial and possibly more defensible in earlier times. Thanks to Mhairi Crewe and family for permission to access the site and help understanding its more recent past.